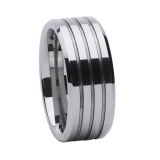 Tungsten carbide ring have entered the market with a bang competing with materials like gold, silver and platinum. 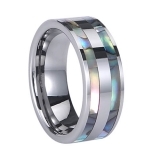 On a periodic table of elements pure tungsten is element, with the atomic symbol W. Combined with carbide in the jewelry making process tungsten becomes a practically indestrucible material great for modern mens ring design, particularly in the form of tungsten wedding ring. Tungsten carbide ring are renowned for their durability as tungsten is five times stronger than steel. It also has the attribute of maintaining a shiny polished look over time. 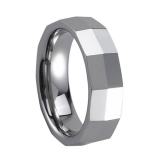 Because of these inherent properties tungsten ring are far more durable than its counterparts in gold and silver. 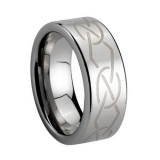 The metallic alternative styling also appeals to those interested in a modern application of men's ring design. 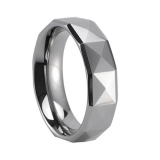 The technology behind creating tungsten ring makes it the most modern incarnation of mens ring design. 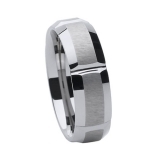 Our tungsten wedding bands are ideal for men between 18 and 30 years old who love representing the latest in men's ring fashion. The stones featured in tungsten carbide wedding bands are usually lab created tungsten cz stone ring simulating the look of diamonds. There are also tungsten diamond ring that feature real diamonds which are considered the hardest natural material as known today making the marriage between tungsten and diamonds a perfect fit of strenght and beauty.